This is the top right panel of the PIT, when "Band 3" is selected from the "Observations / Band 3 / Targets" options shown below the panel. The Proposal Class must be set to Queue, and Consider for Band 3 should be set to Yes, in the Scheduling Section. A video tutorial is also available for this section. Band 3 Observations: Unless your program absolutely needs the very best observing conditions that Mauna Kea or Cerro Pachon has to offer, relaxing your cloud cover, image quality, sky brightness, water vapor or elevation or airmass requirements can greatly increase the chances of the program's getting data; see the Advice for Band 3 web page. All proposals that wish to be considered for Band 3 must fill out this section. Programs are placed in Band 3 only if they cannot be allocated time in Bands 1 or 2. Enter the observations that can be done in Band 3 in this panel. If you already have target/observations defined in the "Observations" section, you can copy/paste (using the "Edit" menu) the observations from there to the "Band 3" section. Then update the observing conditions and time per target as needed. 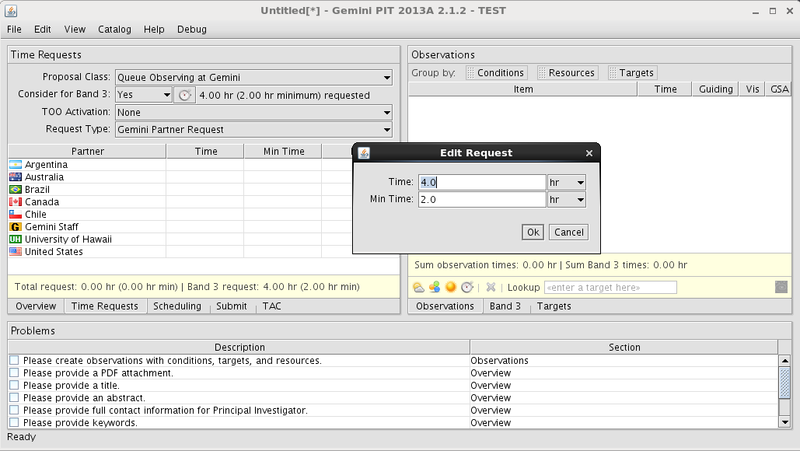 If the program is allocated time in Band 3, then only the observations defined in this tab will appear in the Phase 2. More information on creating and grouping observations is available on the Observations web page.